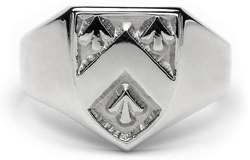 This ring is made to order in your size and coat of arms. Please allow 4-6 weeks delivery. All products sent within Australia are sent through Australia Post, free shipping for orders over $500.